* For every Tri-Adventure event you enter, you will receive one stamp. * For every person you introduce to Tri-Adventure, you will receive one stamp. Collect 6 stamps and you can claim free entry into a Trail, Sprint or MTBO event or 50% off the entry price into an Experience event. You must bring your card with you to registration to claim your stamp. We can then hold on to your card between events at Registration to save you from loosing it! To introduce someone to Tri-Adventure, simply email us their name and, once they enter an event, we’ll reward you with a stamp at your next event. Once your card is full, email us with your intention to redeem your free entry and hand your card in at registration. Cards have no expiry date and are not transferable to another person. 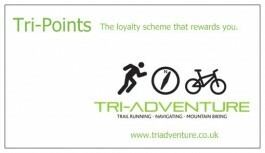 Collect your card at any Tri-Adventure event.